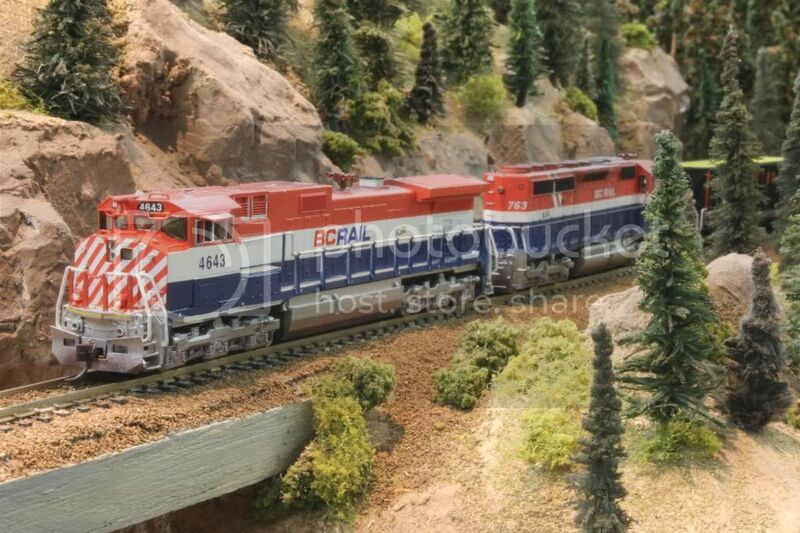 The N scale PGE/BCR 52 '6" TOFC kits are now available for purchase ($25 Canadian) on the Briggs models website. They are on the order page with a part number of NK20. I have attached a few photos of a completed kit which Jeff has built. The NK20 PGE/BCR 52 ' 6" TOFC kit comes with parts sized to fit Micro Trains Bettendorf trucks with low profile wheel-sets, and 1015 couplers in the kit boxes. The kit comes with the body, under-frame, weight, etched grab irons, stirrup steps, cut levers, ramp braces, brake wheel, and tie down chains for an extra detail when running with a trailer on it. Upright and collapsed hitches are included. The Briggs Models flat deck trailers are perfect companions to these new kits and for those that order ten or more of the NK20 PGE/BCR TOFC 52' 6" kits they will get 2 of the flat deck trailer kits for free. (Your choice of the 40' or 45' trailers). If you have ordered 10 or more kits please shoot me an email or PM and let me know which size of trailers you are interested in. Remember to tell him you saw it on the Railwire. Very nice. What are the years of operation for the prototype? The detail work is amazing! Look at that deck! How late would these have run? Did they ever leave Canada? James; The model is not casted. It is 3–D printed to a quality similar to injection modeled plastic kits. As this is a different process compared to regular 3-D printing (i.e. Shapeways) there is no removal of the waxy material on the subject during the printing process. The kits and parts come ready to build. Philip; I am not sure the BC Rail cars ever left Canada, I know the CP and CN versions did. These cars were converted from standard NSC-built 52'-6" flat cars in 1960 and 1961. They served the railway until 1994-1995 when they were withdrawn from service. They did not leave the railway; they were operated in the railway's online trailer service between North Vancouver and points north including Williams Lake, Quesnel, Prince George, Chetwynd, Fort St. John, Fort Nelson and Dawson Creek. It is possible that CN and CP undertook similar conversions from their NSC flatcars, but I do not know for sure. Saw this model in person this morning and it is very well done. The level of detail on the deck, risers and tread plate is outstanding. Looking forward to getting my hands on some. Is this decal set from Highball appropriate? It’s for bulkhead flat cars. Edit: also doesn anyone have any decent pics, (or links to) of the prototype to assist in modeling? The only picture I know of (I'm not a PGE/BCOL modeler) was posted here on Railwire. I saved a copy last November, but can't find the original post. It shows PGE 7010 with a BCOL trailer, part of a BCOL trailer on another type of flat, and part of BCOL 40326, a boxcar. I keep coming back to this post and drooling over this car! One reason is the print quality, which appears to be a huge step forward in 3D technology.